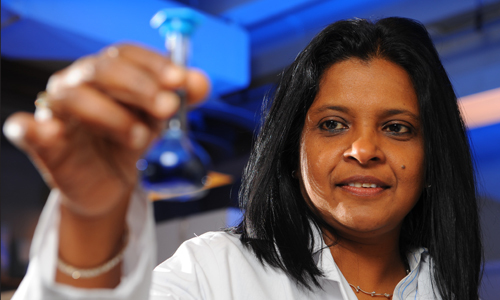 Dr. Kumaragamage is interested in reducing the phosphorus losses from agricultural soils. Phosphorus is an essential nutrient for healthy crops and is often supplied in the form of fertilizers and manure. The challenge faced by farmers is to minimize the phosphorus loss occurring during spring runoff and leaching. Not only does this loss leave the soil impoverished, the eventual phosphorus accumulation in natural bodies of water - most notably, Lake Winnipeg - is of growing environmental and economic concern. Dr. Kumaragamage’s initial task is to compare the quantity of phosphorus losses in fields where manure fertilizers versus synthetically produced fertilizers are applied. Unique to the prairies is the application of manure in the fall as opposed to the spring. The short (and in some years non-existent) spring does not afford sufficient time between manure application and seeding. The fall application allows a longer interaction period between the manure and the soil. Although this longer period may result in the stabilization of phosphorus, it could also enhance losses by increasing the mobility of phosphorus. Conducting comparative studies of liquid swine manure, solid cattle manure, and synthetic fertilizers, Dr. Kumaragamage has established that soils amended with synthetic fertilizer suffer the greatest losses. In the case of manure, greater losses occur when liquid swine manure is applied rather than the solid cattle manure. She intends to test the hypothesis that this is a consequence of form. Soil type also plays a role. In a normal loamy or clay soil, greater losses occur from runoff than from leaching. This confirms the practice by some Manitoba farmers to inject the liquid swine manure and to deep band synthetic fertilizers rather than to surface apply it. In the case of solid manure, injection or deep banding is not possible but fortunately losses are low. Given the practice of manure application in the fall, research into possible physical and chemical changes to manure-applied soil due to repeated freezing and thawing will contribute further data on manure dynamics in soils. Could these changes also accelerate phosphorus mobility by releasing mobile forms into the soil? Dr. Kumaragamage will identify chemical species from incubated soil samples that have experienced thawing and freezing after manure application. Leached samples gathered from lysimeter barrels installed in fields will provide the necessary field data.